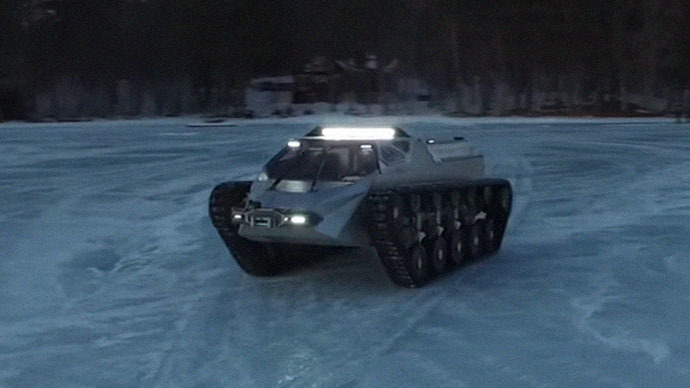 Just as the world is witnessing an outcry over heavy-handed police militarization in the US, a company specializing in extreme, off-road military car tech unveils its newest creation – a sinister-looking speed tank that can drift on ice at high speeds. Howe and Howe wants to make sure that, whatever your needs are (or however bad the super-villain you’re fighting is), it has a menacing machine to suit. Without going into too many examples, just picture a wheelchair ideal for Afghanistan’s inhospitable roads. Yes, they even have a wheelchair on tracks! Enter the Ripsaw EV2 – an updated version to the already scary armored car on tracks, complete with a superhero cockpit that looks way more fun than an actual tank’s would, a Batman-style panoramic driver’s view of the surroundings and lots of flickering lights inside. The moon buggy from hell also comes with advanced suspension tracks and a powerful engine that can pull all that weight when you’re in need of a quick getaway. Now, wherever you stand on vehicular warfare, few surely can resist the temptation to drift on ice at speeds of up to 60 mph. Not much else has been revealed about the new model, save for the speculation that the price will doubtless be out of this world. Here are some more vids of other curious Howe and Howe inventions. Coming up first - no collection would be complete without a SWAT-mobile, for when your sleepy mid-Western town gets out of hand. And of course - the wheelchair with attitude - the Ripchair 3.0, cruising through sand dunes like it's nothing and, arguably, doing a better job of it than some existing off-road vehicles.